pSCANNER is hosting its Year 3 F2F on November 29, 2017 in San Diego, CA. The pSCANNER NLP team released the CLEAN (CLincal note rEview and ANnotation) NLP ensemble pipeline. pSCANNER hosted its annual All-Hands symposium on October 13, 2016 in San Diego, CA. Opportunities to use health information for research are often missed because the networks with information cannot easily communicate or collaborate with each other. The Patient-Centered Outcomes Research Institute (PCORI) is supporting the development of PCORnet®, a National Patient-Centered Clinical Research Network, to bring research and patient care together to explore the questions that matter most to patients and their families. Begun in April 2014 and funded by PCORI, patient-centered SCAlable National Network for Effectiveness Research (pSCANNER) is one of 34 health data research networks that comprise PCORnet. pSCANNER is designed to be a stakeholder-governed federated network that will utilize a distributed architecture to integrate data from existing networks and surrounding health systems covering over 37 million patients. 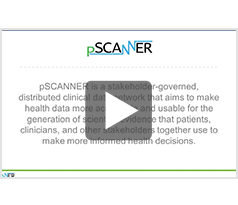 pSCANNER is a stakeholder-governed, distributed clinical data network that aims to make health data more accessible and usable for the generation of scientific evidence that patients, clinicians, and other stakeholders together use to make more informed health decisions.